Description: The Minbari Warcruiser is the most powerful ship among the younger races. Its beam weapon is very powerful, vaporizing most fighters with one quick shot, and cutting into larger ships. The Warcruiser is very large, around 1.7 km tall. 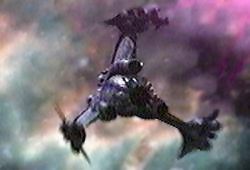 These ships were used with great effectiveness in the Earth-Minbari war, where they almost destroyed all of Earth's forces. There is of course artificial gravity on board. The Warcruiser also carries a large complement of Minbari Fighters. 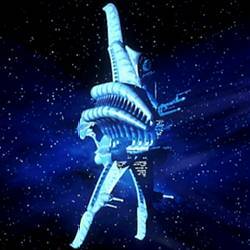 The ruling body of the Minbari, the "Grey Council", has permanent residence on a special Warcruiser. Description: The Minbari Fighter is an extremely maneuverable and fast fighter. Its weapons are three beam weapons positioned around the cockpit, angled 120 degrees apart, that fire in short bursts. The design is heavily based upon Minbari aesthetics, where the triangle is the perfect shape, so the Minbari Fighter has a triangular shape when viewed from ahead. The three "wings" also swept forward, in a reverse delta-wing shape. The pilot lies down looking forward during flight.